My latest novel has just been published! 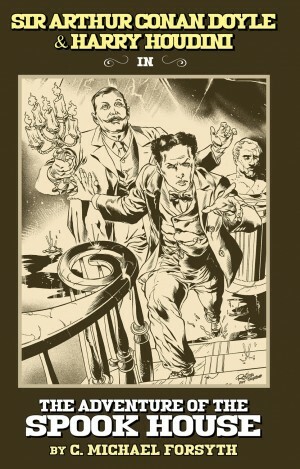 In Sir Arthur Conan Doyle & Harry Houdini in The Adventure of the Spook House, the two extraordinary men team up to solve a paranormal mystery. The year is 1922. A respected judge inexplicably vanishes in a decrepit mansion and two of the world’s most remarkable men are summoned to investigate: Sir Arthur Conan Doyle, creator of Sherlock Holmes, and Harry Houdini, the world’s greatest escape artist. Aided by a beautiful young psychic, the unlikely partners probe a mystery that becomes murkier and more perilous at every turn and brings them face to face with evil incarnate. To solve the riddle of The Spook House—and to survive its dangers—they must call upon all of their extraordinary mental and physical powers. The story draws upon the real-life friendship of Conan Doyle and Houdini, two vastly different men brought together by their fascination with the paranormal. I came up with the idea after stumbling across the intriguing fact that the two legendary figures were friends—and later bitter enemies—in real life. Writing the book took over a year of research, as I tried to capture the personalities of each historical figure as well as, of course, get the details about them and the time period right. I pored over their autobiographies, books on how Houdini managed his escapes and a huge volume of the more than 1,500 letters written by Conan Doyle’s letters. It really helped me to get a handle on how the author of the Sherlock Holmes stories thought and spoke. Sir Arthur Conan Doyle, left, and Harry Houdini, were friends–and later enemies. I learned that each man was, in his own right, brilliant and remarkably athletic—perfectly suited for an adventure of this type. I would be hard pressed to think of a real-life writer and an entertainer who would make better heroes.